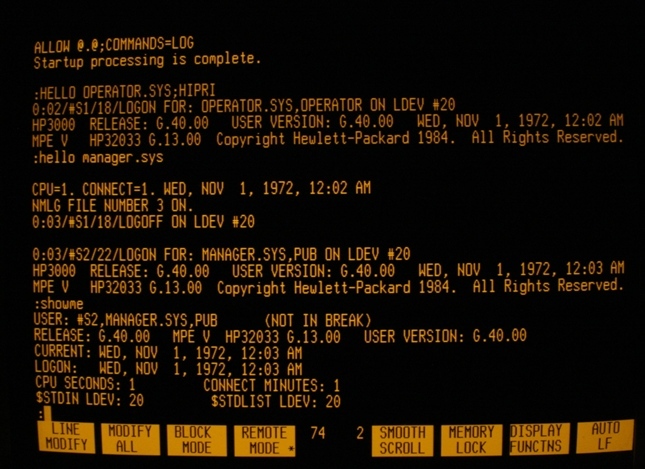 MPE V works with "classic" HP 3000 computers (pre-RISC machines) going back to 1980. This is MPE V version 3P, release G.40. It was the final version of MPE V, released in 1995. It works with HP 3000 39/40/42, 44/48/58, 64/68/70 and the small 3000s: 37, Micro, Micro LX/GX, Micro XE. The disc image (7959B) is configured for a disc drive an HP-IB address 1 and a 9144A tape drive an HP-IB address 3 (these are the standard hardware installation defaults). Please contact us if you would like a pre-installed hard disc image, or installation tape images of this software. Click here to see Lee Courtney use a 3000 DUS tape.